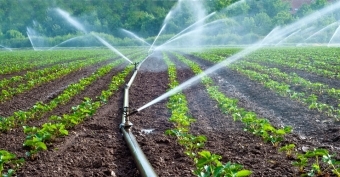 Irrigation is essential for the germination of seed and the growth of the roots of vegetables. It is necessary for the absorption of minerals and nutrients by the plants from the soil, and provides hydrogen and oxygen to the crop. So how do we irrigate? Rain is the best irrigation, of course. If mother nature was our best friend she'd shower us with water every week and we wouldn't have to do a thing. But unfortunately we are challenged with dry spells (3 this summer in fact) and must have a reliable water source. The following methods are used to feed our crops. Solid set irrigation Your typical sprinkler system that is permanently left in the field (like the photo above). Travelling Boom A mobile sprinkler system, which is able to move from place to place. Drip irrigation - Tubes are placed under plastic mulch, which allows water to drip slowly into the soil. (See our weeds blog to learn about plastic mulch). We use this for crops such as juliette tomatoes and zucchinis. In-ground drip irrigation - Tubes are placed under the soil directly in the root zone of the crop. This method is used for storage roots such as carrots and onions. 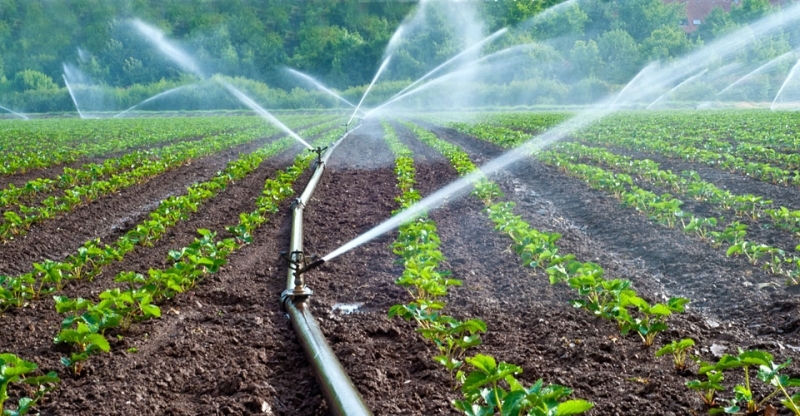 Drip irrigation uses 30-40% less water than the sprinkler methods. This is ideal as you can control the minimum amount of water that the roots get so they don't dry out. We have a permit to take up to 80 gallons per minute and our pump is set to take under that. The flow of the creek is normally several hundred gallons per minute and we only irrigate a small portion of the time. The Nottawasaga conservation authority monitors the creek and would advise if the irrigation is adding to low water level stresses that already occur. We have never had to alter our use so we assume that it does not adversely affect the ecology of the water shed. As farmers we are always keeping an eye on the weather. Too little rain means we have to use irrigation, which we'd love to do as minimal as possible. And too much rain can affect the crop's health and yield, and our plans for harvesting, seeding and weeding. Thankfully this year has been a pretty good growing year, despite the dry spells and hotter than average temperatures. Fall harvest here we come!! !